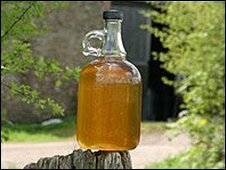 There's good news for "real" cider makers in Somerset as the government has announced plans to tighten up its definition of the drink. From September, it hopes to introduce a minimum juice content. It's not yet been decided what that minimum juice content will be. Those who make the grade will benefit from the scrapping of plans to increase cider duty. The government said a thoughtful approach to alcohol was needed. Treasury Minister Justine Greening said the government was looking for ways to target heavy drinking, but admitted problem drinks tend to be ciders which have very little apple content in them. "We've been working with the industry to come up with a definition of cider which protects our great British cider makers but actually protects problem drinkers," she added. Louisa Sheppey, the director of Sheppey's Cider which is based in Bradford-on-Tone, said the duty would have disproportionately impacted them. "We're pleased they're offering a system which properly reflects the impact cider makers have on the market because they (the government) are particularly interested in the social impact of some cider drinking and our cider isn't the sort of cider that is drunk in the street." Ms Sheppey said she was not sure what the percentage of apples would be in ciders. "Our cider is 100% apple juice or as near as we can get it. In certain summers like this one, unless we're going to get some rain soon, the apples are going to come in very dry and very concentrated and will produce very high alcohol content that we need to manage. "Beyond that, we do not dilute any of our ciders at all so it's very much about apple juice fermentation so really however they're going to set this, it's not going to affect us and that gives us a little bit of protection."